A&A Research Scientist Christopher Hansen with the LTX experiment at PPPL. Those challenges are worth hammering out because fusion energy has enormous potential to replace fossil fuels in our power plants and also make long-range space travel possible. The University of Washington has been a leader in fusion research and the plasma confinement system called a tokamak, and DOE’s awards will advance the university’s efforts to improve the process and current inefficiencies in heating plasma to such high degrees and making the process more economical for smaller-scale models. 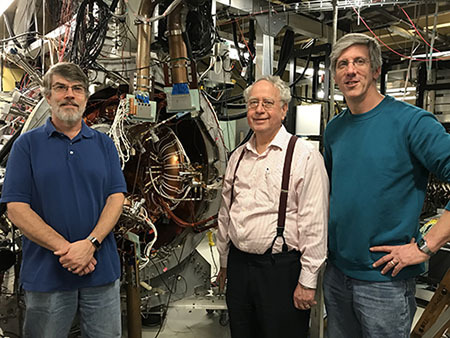 Research under principal investigator Hansen, in collaboration with researchers at the Princeton Plasma Physics Lab (PPPL), will provide a computer model of plasmas produced in the recently upgraded Lithium Tokamak eXperiment (LTX-b) at PPPL. This experiment aims to tackle two main challenges of heating man-made plasmas due to plasma inevitably coming into contact with the wall of the chamber: the chamber wall can melt and the plasma will cool, requiring more heating and lowering efficiency. Brian Nelson, Tom Jarboe, and John Rogers in UW's HIT-SI lab. The other grant, led by principal investigator and A&A Research Scientist Roger Raman with his colleagues Tom Jarboe, Brian Nelson, and John Rogers, will advance Transient Coaxial Helicity Injection (CHI), which was originally developed here at the University of Washington in A&A’s HIT-SI lab. 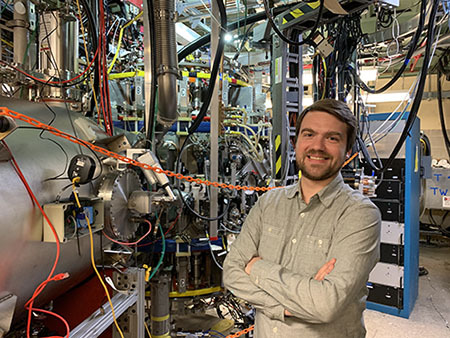 This method is a step in simplifying a fusion reactor to make it more economical, and therefore, scalable, for widespread use in power plants. This work will be done in partnership with the University of Wisconsin, Kyushu University in Japan, and PPPL.